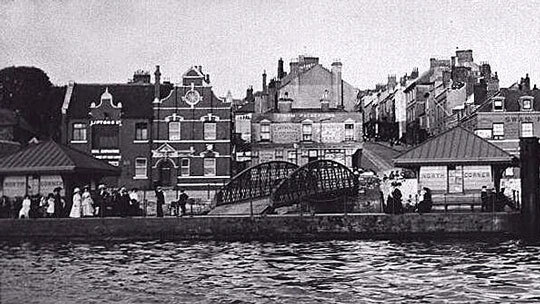 Edwardian photo of the pontoon and bridge; the attractive building behind, with the round window, is the Piermaster's Office. Postcard of North Corner Landing stage circa 1920. The image above gives a closer view of one of the original waiting rooms upon the landing stage - there was one at each end. The waiting rooms were eventually removed during the late 1960s. Another early 20th century postcard. Behind the Watermen is the bridge across to the pontoon; a riverboat with passengers is just visible, moored alongside. The landing-stage at North Corner was officially opened in November 1883 by the mayor of Devonport. When new, there were no motor-cars, and due to the volume of river traffic, carrying both passengers and produce, the landing-stage became an important feature of life in Devonport. Now, 130 years later, it has become a part of Devonport's culture. 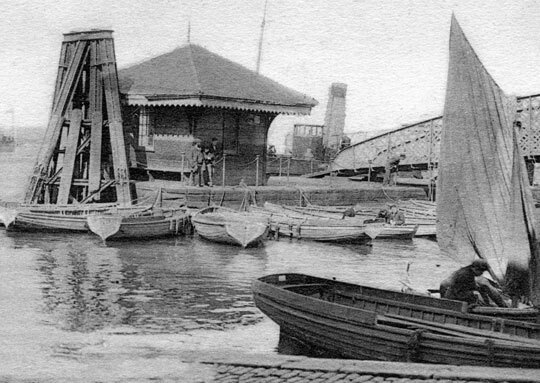 To operate the landing-stage Devonport Corporation installed a Piermaster, but it was sixteen years before the associated Piermaster's House was built; a temporary office sufficed in the meantime. The first Piermaster was a Mr G. Hocking. The role of Piermaster was made redundant by the city council during the 1960s. 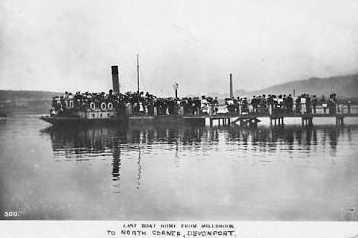 Postcard showing queues of people waiting to board the river boat. The text is 'Last boat home from Millbrook'. The sender of the card had written underneath in his own hand, “to North Corner, Devonport". In it's heydays the pontoon was the departure-point for regular ferries to Millbrook, Saltash and Cremyll, plus many recreational river excursions to the River Yealm or up the River Tamar to Weir Head. 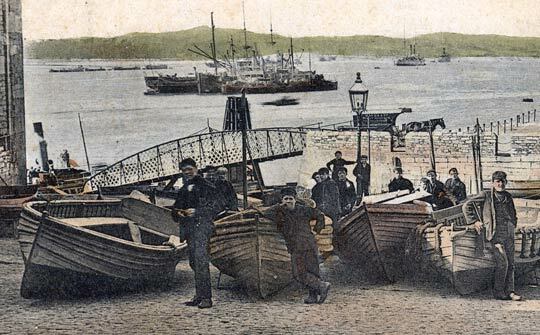 For a period between 1901 until around 1931 this landing-stage was an official extension of the Torpoint Ferry service, taking foot passengers only; the vessels used were Volta and Lady Beatrice. There are no longer regular ferry services from North Corner, these ended in the late 1960s, but the landing-stage is still in use, by fishermen, rowing clubs, boaters, localised usage from nearby residents and by booze-cruise companies during summertime river-trips. 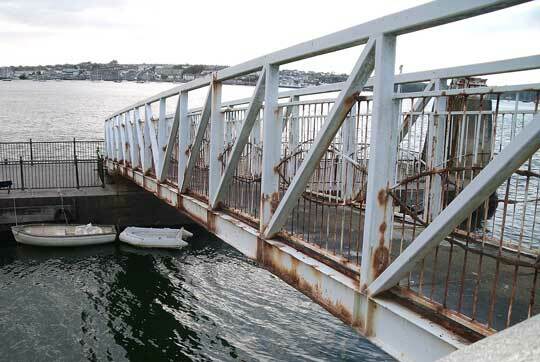 Correction - the landing-stage was still in use, until summer 2012 when it was suddenly closed by Plymouth City Council. 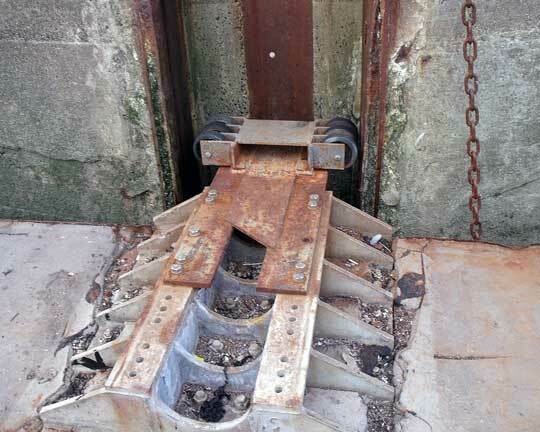 The reason given by the council for closure of the landing stage was that it was ‘deemed unsafe for public use following a structural survey’. 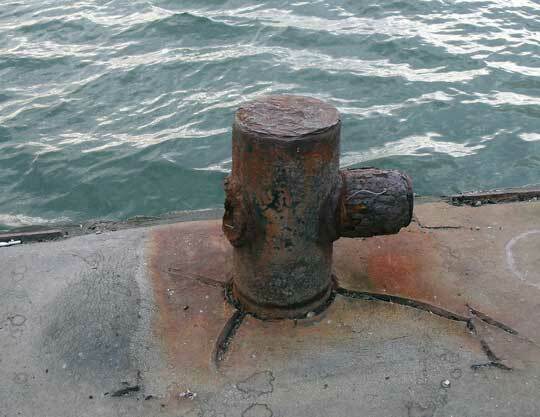 The council cut the bollards in order to stop boats from tying alongside. A key challenge defined in the Estuaries Management Plan was specified as: ' Fulfilling the potential for water borne public transport. The required Action to meet this challenge was to promote the findings of the 2004 Water Transportation Study (which as noted above saw a need for retaining the North Corner landing-stage and providing a new ferry service from there). 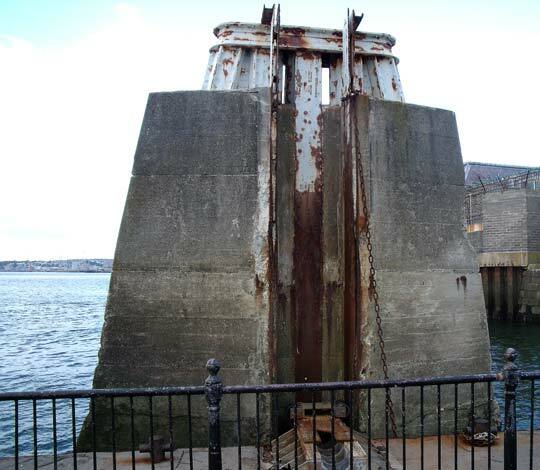 Sandy Borthwick and Philip Head, amongst others, created a Petition to save the landing-stage, not only because it is an historic/cultural feature of Devonport but also because it is still in constant use. Much support has been generated for the Petition already, including from Oliver Colvile MP. 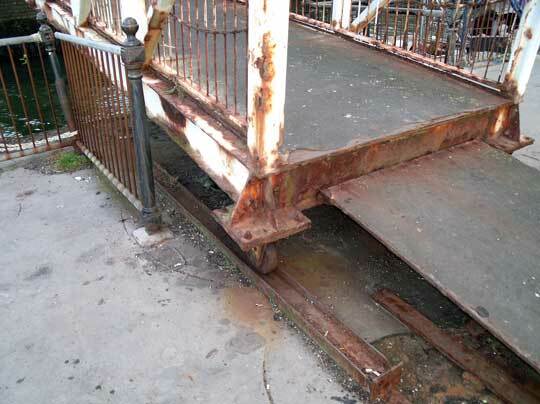 Mr Colville is strongly in favour of retaining the landing-stage and is appealing to the city council to seek sources of funding for the repair, as well as raising the subject with colleagues in the House of Commons. As you know with Petitions, it is numbers that count - your help would be appreciated. The Petition has now closed, thank you to all who responded. The outcome, which could take several months, is awaited.